In my experience as a programmer, trainer, technical coach and then organizational coach I observed a correlation between various systems around me. Especially when working with various teams to transition from one way of working to another, I facilitate the restructuring of the links between these systems. Situation: A medium sized organization that has the Development Lead, Testing Lead and Operations Manager as roles. Their problem is they deliver a feature in 6 months on average. Their CEO wants them to deliver faster, because the clients are waiting too much and they could lose business. When restructuring such an organization I take a systemic approach: I want to understand the relationships between these departments and what blocks them from faster delivery. I talk with the people, look at their delivery cycle, understand their technical practices, discover their business model, etc. 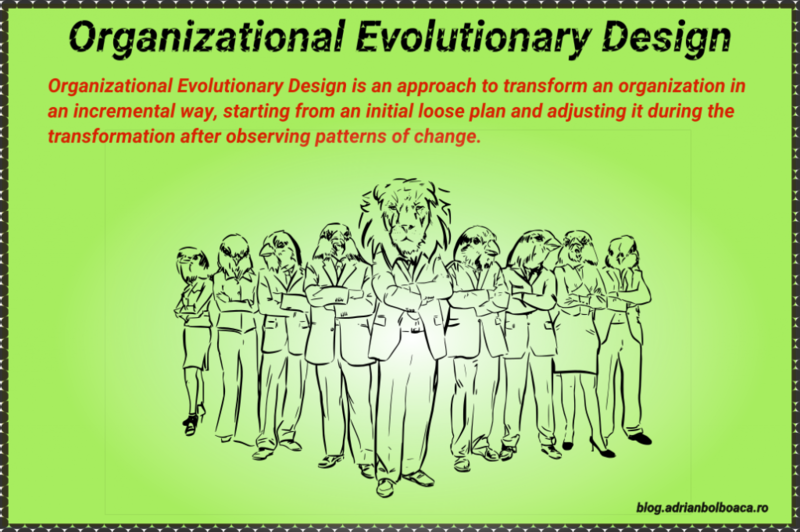 The result of this assessment is a change roadmap created specially for their organization. We discuss this roadmap together, I make sure everyone understands it and we adjust it where needed. I make the roadmap public and keep it up to date. It looks like a board with next actions, current actions, and what is done. In this situation it is virtually impossible to know how much time it will take to get to a normalization. I can use my experience and have an educated guess, but the error is quite high, as it’s just a guess and not an estimation. I adjust this roadmap daily, depending on the problems that arise and the feedback from the organization. The purpose is to have the organization increase their performance step by step, in their own time, with their own strengths, weaknesses and resources. I am just a facilitator of improvement, of normalizing growth from their initial level to an improved level. We measure at each step how well we are and if the organization decides they are good enough, I leave and leave them independent. I call this process Normalizing Growth. Normalizing Growth is the process of observing the natural traits of a system and adjusting its growth patterns so it can become a sustainable self-reliant ecosystem. Think about when you were a kid and started to be independent; you could go to school or friends alone, without adult supervision. After a while the organization calls me back because they know they can perform better. I analyze again their current system, talk with people, and we discuss about their expected outcome. In this moment they want to optimize their processes in a specific direction. When you optimize any system you need to compromise. An organization cannot be 100% of time working for clients and still be a learning organization. So you need to reduce the time for some areas and increase it for some others. My help in this situation is to find the right compromise, given their business strategy. We create again a roadmap to change certain areas. Usually during this stage people are more autonomous, some levels of management disappear and specialists become internal coaches or mentors. This is the first step to transform into a learning organization. Usually I leave the organization after a while and they are more effective, but also more dynamic. The second step in evolving an organization is Optimizing Growth. Optimizing Growth is finding the good compromise for using the time and effort in the right directions so the organization can grow naturally on its strategic direction. Management is transformed to observation, coaching and leadership. Not many organizations reach this phase. Most of them would’t have better business if they would move from Optimizing Growth. This next step is useful for organizations in a very dynamic business, small organizations that want to have great business in their market. Typically these organizations have good or great profits with few people. For example one organization has 15 people and a direct profit of 13 million € per year. In the same city there is another organization that has 350 people and has a direct profit of 14 million € per year. The first one would be willing to maximize growth. The latter would maybe need to first Optimize Growth, and it would then be enough. Maximizing Growth means having a systemic approach to all the activities. All the people from the organization know the business direction, take active actions to improve their activities with respect to business metrics they all analyze quite often. The organization is comprised of people sharing the same business goal, but independent from each other from the management point of view. They don’t have managers, but they manage their work. When restructuring an organization in a Big-Bang approach you analyze -> estimate -> plan -> execute. But the problem is that there are so many variables and the people in the organization might mimic the change. So often I see people pretending they acquired the new skills, but they work in the same old ways. So it’s like changing bits and pieces, but leaving everything the same. In this situation you can estimate how much time it takes for an organization to reach a certain goal. It doesn’t mean the approach is necessarily better for the organization. It’s like applying a plan blindly just because you created it in the first place. This situation is very good for managers, because they are in a safe space and can plan budgets and justify their work. This type of normalization comes natural, with applying a model. You can call it in any way, most of them have acronyms and are presented as the best for everyone. Many people come in the organization and teach the new model. Often people agree, sometimes they disagree with the new model. Anyway it is a strategic decision and it needs to keep going until the plan is executed and the transition is made. Only a few organizations can reach this stage when applying Big-Bang approach. Most often it happens the model the chose for growth fits like a glove and then it’s just a natural phase to continue and optimize growth. This is a happy situation, because unfortunately not often a model fits very well an organization. I think you can forget about maximizing growth when directed, managed change is implemented. Reaching this phase needs systemic thinking and any growth model would need to be substantially adjusted. When you want your organization to perform, think about the whole ecosystem and adjust it accordingly. Without external help it is quite difficult to have a fresh picture and try new things, but not impossible. My recommendation is to always keep trying maximizing growth. The enemy of maximizing business growth is maximizing the number of people and transforming a small organization into a big organization based on internal politics and not on business metrics.